Dybles are delighted to present for sale this spacious, four double bedroom semi detached family home with an integral garage and situated in a quiet close within the ever popular residential area of Harestock, Winchester. The property is ideally located for access to nearby shops, bus stops and falls within the catchment area of the highly regarded Harestock Primary and Henry Beaufort Secondary Schools. The well proportioned accommodation is split over three floors and comprises on the ground floor: Entrance hall, large living/dining room, kitchen, and conservatory. 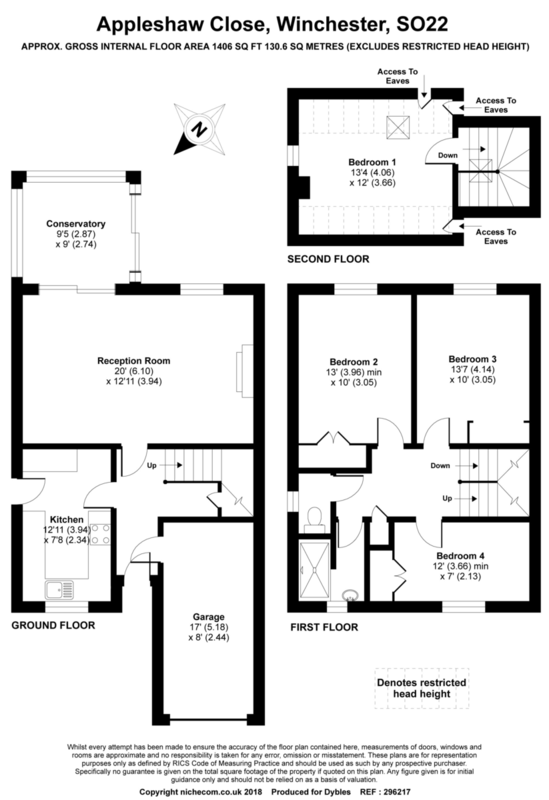 First floor: Three double bedrooms with built in wardrobes and a modern shower room; Second floor: Large double bedroom with eaves storage. The property also benefits from double glazing and gas fired central heating. Externally there is a generous rear garden mainly laid to lawn and space to the rear and side of the house for a potential extension, subject to necessary planning consents. To the front there is also a block paved driveway allowing parking for three vehicles leading to the single, integral garage.